The squatters camp inside St James Barton roundabout, locally known as 'The Bearpit', in Bristol's city centre. 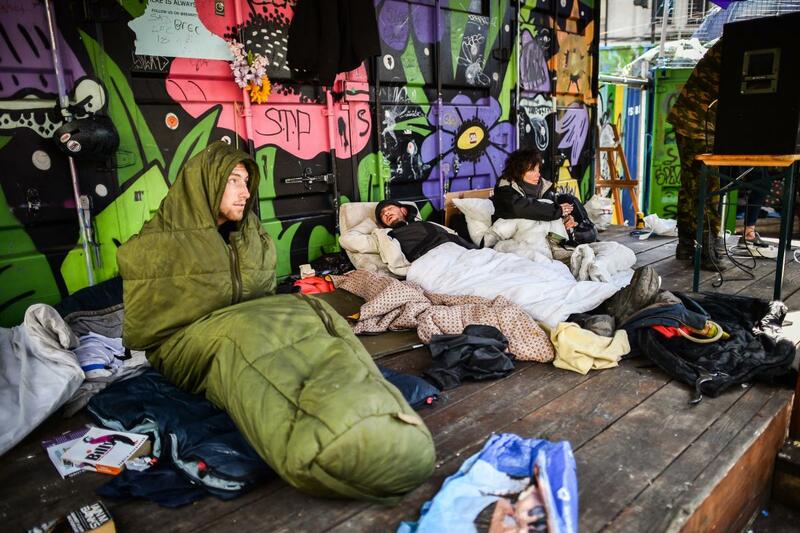 Squatters who are living on a famous Bristol landmark are resisting attempts to evict them. They have called on Bristol City Council to work with them rather than trying to get them ejected from the Bearpit roundabout. For the past three weeks, a group of up to 30 people have been living in shipping containers and a double decker bus which used to be independent cafes. Some of the squatters are homeless and some are squatting as a protest against council plans to take back control of the Bearpit and begin plans to refurbish the area. Bristol City Council has begun eviction proceedings in the civil courts because it wants to turn the Bearpit into a food innovation hub, with space to accommodate up to 40 businesses and create 160 jobs. One of the squatters, known as "Midnite", said the Bearpit should be a space for the whole of the community. "Get events on, get the markets that used to run here open and stop them gentrifying the place because we don't need any more coffee shops, we need community space," he said. He described the council's attempts at evicting them as "ridiculous". "Since we have been here at the Bearpit, the anti-social behaviour has gone down and it is becoming a safer place for people to walk through," Midnite said. "We are not doing this as a place for us, we are doing it for them and the future generations. "Stop the legal action and allow us to continue our work. We are doing things here on a shoestring budget with help and donations from members of the public." The squatters camp inside St James Barton roundabout. Bristol City Council said incidents of crime and anti-social behaviour have increased since the group moved in. "We're aware of a number of people squatting in council-owned structures in the Bearpit and have concerns about their health and safety as these structures are unsuitable for people to live in," a council spokeswoman said. "We recommend that anyone squatting there who is homeless or at risk of homelessness to talk to the outreach workers visiting the site regularly. "We also have concerns about the further increase in anti-social behaviour and crimes being reported in the area over the past few weeks. "We're monitoring the situation closely with Avon and Somerset Police and will be in regular discussion with officers about the safety of all in the space. "We are responding to calls from the wider community to improve the area of the Bearpit so that everyone can feel safe in the space. "To achieve this we will need to clear some of the items, however this work is currently on hold while we work with The People's Republic of Stokes Croft and squatters."